Towards the end of Kiss Kiss, Bang Bang, director Shane Black stages the following sequence. Harry Lockhart (Robert Downey Jr) is perilously hanging over a busy motorway, clinging for dear life to the arm of a corpse, which is poking out of a coffin, which is somehow stuck on the side of a bridge; and Harry is firing his gun at the bad guys who are in one of the cars below. It was about this point that I finally decided to give up all resistance and came to the conclusion that - all things considered - Kiss Kiss, Bang Bang is a pretty entertaining movie. I wasn’t always so sure; there were times when I hated this movie, times when its tricksy post-modern approach and Hollywood in-jokes irritated rather than amused. But Black manages to throw so much at the screen that some of it is bound to stick and, and the film somehow won my favour in the end - just. You may or may not recognise the name Shane Black. 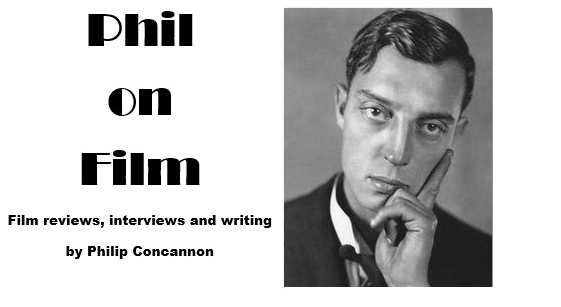 He was the young scriptwriter who struck gold with his first screenplay, an action comedy named Lethal Weapon, and later saw his script for The Long Kiss Goodnight make him the highest paid screenwriter in Hollywood history. After that film Black disappeared and has now returned with the kind of action-packed and comical buddy movie which made his name, only this time he’s directing his own work for the first time. At first this seems like a bad idea. Black is clearly anxious to make an impact in his new role, but in trying too hard to impress he starts this movie about as badly as a director possibly could start a movie. Harry Lockhart is our lead character and our narrator, but with the post-modern slant of this movie he says things like “I’ll be your narrator, I don’t see any other narrators around here so shut up” or “don’t worry, I saw Lord of the Rings and I’m not going to end the movie 17 times”. This isn’t such a bad thing in itself but Black’s hectic filmmaking style in the opening twenty minutes - a chaotic blend of flashbacks, freeze-frames, visual trickery and self-conscious quirks - almost sinks the film before it has begun. Thankfully Black settles down into a rhythm after a while and remembers to tell something resembling a story. Harry Lockhart is a small-time thief who is on the run from the law when he stumbles into a casting session and, in his traumatised state, is hailed as an exceptional method actor and packed off to Hollywood. He is lined up for a detective film and is scheduled to spend some time with a detective known as Gay Perry (Val Kilmer) for research purposes. Harry also comes in to contact with childhood friend Harmony (Michelle Monaghan) and between the three of them they get mixed up in an incredibly convoluted murder plot. There’s little sense in trying to follow the intricate plots twists which subsequently occur, and when I realised that fact I suddenly started to enjoy Kiss Kiss Bang Bang so much more. Black’s film is an homage to Raymond Chandler stories (the film is divided into chapters, each named after a Chandler novel), an action movie, a buddy movie and a Hollywood satire with a touch of slapstick and romance chucked into the mix for good measure. It shouldn’t work but, thanks to some fine performances and the sheer enthusiastic glee Black brings to the project, it does. 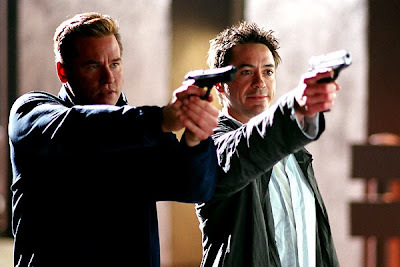 Kiss Kiss, Bang Bang doesn’t work half as well when these two aren’t on screen together and the creaky machinations of its storytelling start to become more intrusive as Black attempts to wind things up. There is also the matter of the film’s increasingly queasy morality which invites us to laugh at one senseless murder while expecting us to feel pain at another. Black is trying to have his cake and eat it with this film and his flippant approach to the film’s abundant violence precludes the emotional involvement he tries to invest it with late on. Nevertheless, Kiss Kiss, Bang Bang has more invention than most Hollywood thrillers can muster these days. It is never more than the sum of its parts, but when the film does work the results are tremendous fun and it eventually built up enough goodwill to allow me to overlook many of its deficiencies. It’s a confident start to Black’s directorial career and it will be interesting to see where he goes from here. Kiss Kiss, Bang Bang is far too clever for its own good and massively flawed, but you can’t deny the fact that it delivers plenty of bang for your buck.